Meat Hinders Your Heart and Your HEAD! Dr. William H. Thies, Ph.D., Alzheimer's Association Vice President says, the link between Heart and Alzheimer's disease is growing in strength every few months. Thanks to the dedicated marketing efforts of the meat and dairy industries, many people still believe that eating fish, chicken, and other meats is good for you. In fact, the saturated fat, cholesterol, and total lack of fiber in meat and dairy products have been conclusively linked to numerous diseases, including the world’s three biggest killers—heart disease, cancer, and strokes—as well as Alzheimer’s disease. Indeed, a flood of research shows that the toxins in meat, including chicken and fish, increase your risk of developing Alzheimer’s disease, while the antioxidants in vegetables help prevent this deadly disease. This medical exhibit depicts a lateral (side) view of the brain with color-coded regions indicating the areas of the cerebral cortex commonly affected by Alzheimer's Disease. Affected areas labeled on the cerebrum include portions of the frontal lobe governing intelligence, judgment and social behavior. 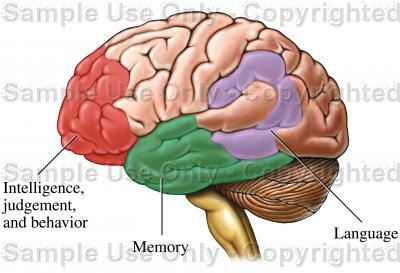 Also illustrated are affected areas of the temporal and parietal brain lobes that govern memory and language. In the wake of former President Ronald Reagan’s death, there has been a flurry of public discussion about Alzheimer’s disease and the Reagan family’s push for stem-cell research. The public would also benefit from being informed that Alzheimer’s, although not currently curable, can be prevented. Vegan Campaign Coordinator Matt Rice, who lost his grandmother to Alzheimer’s a little more than a year ago says, our loved ones don’t have to suffer like this. Research has shown that Alzheimer’s disease is as preventable as heart disease. It is caused by our addiction to meat and other animal products. Fortunately, simple lifestyle changes can help lower your cholesterol levels and greatly reduce your risk of developing Alzheimer’s disease. Studies have shown that it is possible to not only prevent but even reverse the build-up of deadly arterial plaques and reduce the risk of developing Alzheimer’s disease by lowering one’s cholesterol. A healthy vegan diet consisting of whole grains, fruits, and vegetables is the best way to reduce overall cholesterol levels. In fact, Alzheimer’s disease rates have been shown to be 70 percent lower in people following a diet, rich in whole grains compared to the traditional American meat diet.